Why do you celebrate Christmas? - Do you honestly believe that Christmas celebrates the day of Jesus' birth? Or, is it because of tradition? Let us examine both of these bases, searching for legitimacy in either. December 25 - Whose Birthday? - Whose Tradition? When was Jesus born? Neither the Bible nor any known writings claim to record His birth date. All available information supports an earlier time of the year for His birth. Then why do we observe December 25th? This date was first officially recognized on Roman calendars about 336 A.D. (sanctioned by Pope Julius in 350 A.D.) having been decreed by Pope Sylvester in 320 A.D. to coincide with the sun-god feast, Saturnalia. Indeed, Rome was originally called "Saturnia", city of Saturn, after the Babylonian sun-god. Saturn ("the hidden one") is the secret name that was revealed only to members of the mysterious Babylonian religion (The Brotherhood). The connection is clear. But the Romans did not invent the festival. December 25th was celebrated worldwide for thousands of years before Jesus was born under various names - all commemorating variations of the false trinity consisting of a father, mother and child. 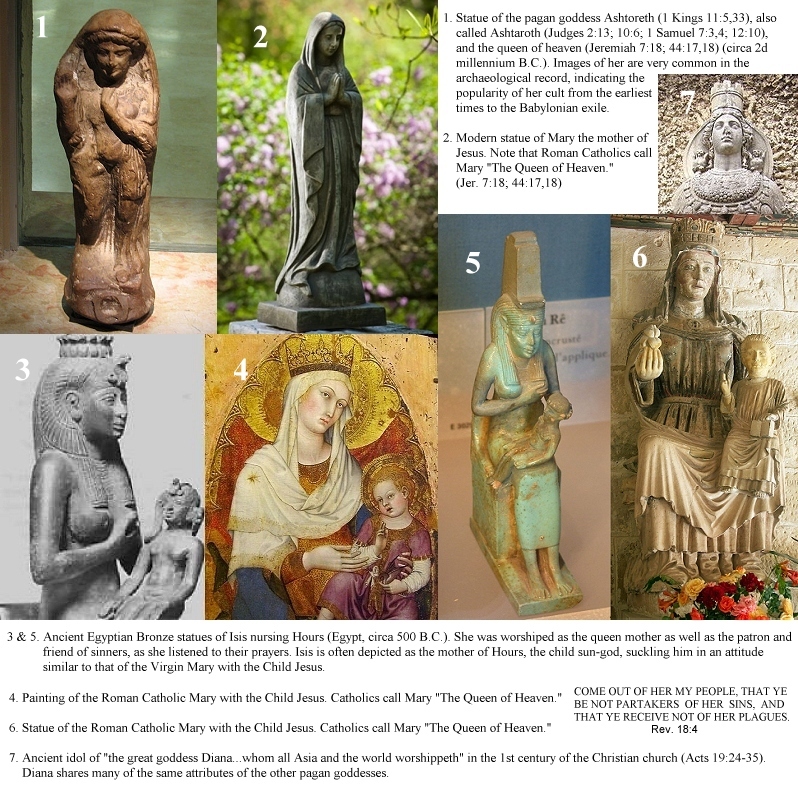 The mother is the queen of heaven while the child is the false messiah (god of light). As Hislop (The Two Babylons) clearly demonstrates, the various stories are based on historical fact. It began in ancient Babylon where Semiramis, the mother and wife of Nimrod (the "rebel"), tried to retain her power after his death by marrying another (later-born) son (Tammuz) and declaring him to be the reincarnated Nimrod. Through migration this story spread throughout the world. Father is also called Baal, Osiris, Orion, Molech, Saturn, Odin, Cupid, Seb (Shu), etc. and is symbolized by the yule log. 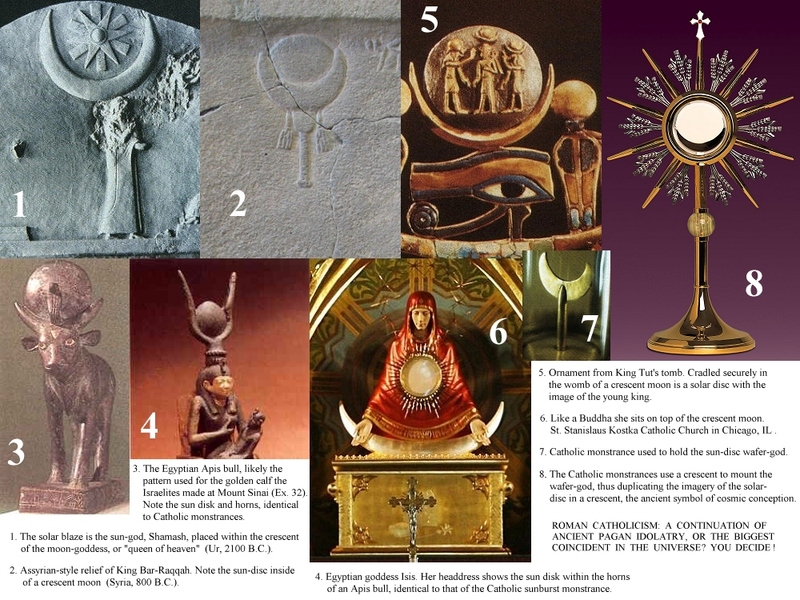 The mother is also, Ishtar, Astarte, Venus, Diana, Aurora, Aphrodite, Isis, etc. and is symbolized by the mother holding the infant child. The child (or yule), is also known as moon god, Lord of Misrule, (wantonness and drunkenness), Bacchus, Thor, Lord of the Fir-tree, and Horus. One example is most enlightening. This shows Aurora as the goddess of the dawn giving birth to the "light bringer" -who is to enlighten the world (Memnon). Isn't it interesting that Lucifer is referred to as "son of the morning" (Isaiah 14:12)? The Bible tells us that "Satan himself is transformed into an angel of light" "which deceiveth the whole world" (II Cor. 11:14; Rev. 12:9) (see THE TWO BABYLONS, Alexander Hislop, 1862). December 25th is not the birthday of Jesus or a Christian tradition. However, it has been decreed to be a Roman Catholic holiday. Cardinal Newman, in his book, admits that all holidays, seasons of devotion and images are of pagan origin. Christmas was adopted from the worldwide celebration of the re-birth of the sun-god (anti-christ) which was marked by drunken, de-baucherous orgies. Not what we thought is it? Was it "christianized" by Church adoption? The simple answer is NO! The Encyclopedia Britannica informs us that the festival of the nativity was not observed in the primitive church(Encyclopedia Britannica, 7th Ed., 1830-1842). Neither the apostles nor the early church celebrated His birth, at all. In 245 A.D., keeping His birthday was declared to be a sin. The Reformation Protestants did not, Puritans and Pilgrims even outlawed it in the 1600's, and as late as 1855 Presbyterians, Baptists and Methodists refused to recognize it as a holiday. Public schools in Boston were still open for classes on December 25th as late as 1870. In fact, Webster's Dictionary tells us that as late as 1913 many States did not even recognize it as a legal holiday (Webster's Revised Unabridged Dictionary, 1913 Ed., p. 253). Christmas did not begin to be a legal holiday anywhere in the United States of America until the 19th century when Alabama became the first state to succumb to its spellbinding influence in 1836. The modern Christmas tree was not introduced to this country by Germans until the 19th century. The annual tradition of erecting a Christmas tree at the White House did not begin until 1889, and the first National Christmas Tree was not erected until 1923 in Washington, D.C., some 147 years after the birth of our nation and 316 years after the first permanent English settlement in America (est. 1607, Jamestown, Virginia, named after the Christian King James I of England). (Because of its heathen roots, Easter too was dismissed as a pagan holiday by the nation's founding Puritans and did not begin to be widely observed until after the Civil War era coinciding with the spread of Roman Catholicism). For a period of three hundred years, from the first permanent English settlement in America in 1607, the majority of Bible believing Christians did not celebrate Christmas in America. But with the influx of Roman Catholics since the mid to late 1800's the practice spread and gained acceptance by all but the "remnant". For more than three centuries, the vast majority of American pulpits reverberated with the sound doctrine of the Holy Scriptures. As late as 1953 the Book OF Common Prayer of the Episcopal church in America describes Romish Masses and Transubstantiation as blasphemous fables, and dangerous deceits.(Article 31, p. 609). Ministers of the gospel knew the true source of man's salvation as revealed in the scriptures. They also knew the source of man's depraved nature and his inclination to follow dangerous heresies. And this is why pastors of churches regularly preached against false doctrines and cunningly devised fables, thereby preventing the Romish doctrines from gaining a foothold in America for nearly three centuries. It is only in the last two generations that many, if not most, American Christians have become ignorant of the history of the world, of the history of their nation, and of the history of the churches both at home and abroad. Other familiar christmas traditions such as mistletoe; evergreen trees, boughs and wreaths; exchanging gifts; burning of incense and candles; revering mother and child; yule log; christmas goose; wassailing (punch) bowl; etc. all have the same pagan roots. Rational people can only conclude that christmas festivities are nothing more than idolatrous rituals to which the name "Christian" has been added. This unholy mixture did not fool the early church or the Puritans and Pilgrims. Neither should we be fooled. "Learn not the way of the heathen ... For the customs of the people are vain" (Jer. 10:2-3). "Abstain from all appearance of evil." (I Thess. 5:22). "Come out from among them, and be ye separate, saith the Lord, and touch not the unclean thing; and I will receive you" (II Cor. 6:17). The following information is from The History of The Reformation of Religion in Scotland by John Knox. The establishment by St Columba of a seminary in Iona was highly favourable to the cause of literature both in Scotland and England. How far it tended to promote evangelical religion, does not clearly appear. The form of sound words, and the image of Christian worship, are often long retained after the living spirit of the gospel is gone; and nothing proves more clearly the fact of its departure than an overweening attachment to superstitious practices, and an observance of rites and seasons which God has not ordained. When the apostle Paul found the churches in Galatia observing days, and months, and times, and years, he expressed his fear that he had laboured among them in vain. These things were an evidence of their declining in their spiritual state, and departing from the faith. Long before this period of our history, we find our Christian ancestors stickling about the proper time of keeping Easter, when they ought to have rejected it altogether as an observance which God had not required. In the time of St Columba, the controversy was revived, and after a keen contest the eloquence of those who favoured the church of Rome prevailed. St Columba yielded, whether from conviction, or from some other cause, we are not told; "and the Pope found in the Abbot of Iona himself, a sedulous and devoted convert to the new lunar cycle." Russel's Prelim. Diss. to Keith's Scottish Bishops, p. lxxv. CHRISTMAS - from the Encyclopedia Britannica 11th Ed. We know from the Bible that the apostles of Jesus Christ did not celebrate his birthday. And we know from other historical accounts that the early Christian church did not celebrate the birth of Christ. In regard to the day or month in which the Saviour was born, a subject to which the devotion of a large proportion of the Christian world has attached much importance, we have no means of accurate knowledge.(Encyclopedia Britannica, 7th Ed., 1830-1842). If God had wanted us to celebrate Jesus Christ's birthday, one would think that at least one Bible verse would mention it. There are no Bible examples of the apostles or the disciples keeping December 25th (or any appropriate corresponding day of the year) as a holy day. When the Roman Emporor, Constantine The Great (A.D. (285)306-337), used the corrupt manuscripts of Eusebius (A.D. 260-340) and Origin (A.D. 184-254) to merge Paganism with Christianity in the fourth century, the Roman church quite naturally incorporated pagan customs and rituals into her many unscriptural doctrines (praying to saints, use of images in worship, purgatory, Mary worship, Sunday sacredness, celibacy of the clergy, etc.). And, unlike the disciples in the New Testament who suffered rejection and persecution for the word of God and their faithfulness to the scriptures (1 Peter 4:3,4), many apostate Christians simply accepted these false doctrines and teachings and chose to observe anti-biblical pagan holy days (holidays), thus limiting or avoiding persecution altogether. There is not a single Bible verse indicating that the apostles or disciples practiced any of the heathen customs mentioned in the above article. There are, however, a number of scriptures in the Bible instructing us not to borrow the customs of the heathen or pagans to worship the true God: Thus saith the LORD, Learn not the way of the heathen... For the customs of the people are vain:(Jer. 10:2,3). Take heed to thyself that thou be not snared by following them... and that thou enquire not after their gods, saying, How did these nations serve their gods? even so will I do likewise. Thou shalt not do so unto the LORD thy God:(Deut. 12:30,31). that ye commit not any one of these abominable customs, which were committed before you, and that ye defile not yourselves therein: I am the LORD your God.(Lev. 18:30). And if it seem evil unto you to serve the LORD, choose you this day whom ye will serve; whether the gods which your fathers served that were on the other side of the flood, or the gods of the Amorites, in whose land ye dwell: but as for me and my house, we will serve the LORD. (Joshua 24:15). SUNDAY IN ROMAN PAGANISM, 1944 IS SUNDAY SACRED AND HOLY? See WHAT MUST I DO TO BE SAVED ?